"Reed left quickly but stopped to say he was pround of the race he ran. He said he had no plans to run for office again right now." That must have hurt for a man who, just a year ago, was being discussed as a future GOP presidential hopeful. Reed's loss to Casey Cagle was notable not only because it made him the first political casualty of the Jack Abramoff scandal, but also because of how steep and fast Reed's fall from political grace has been. 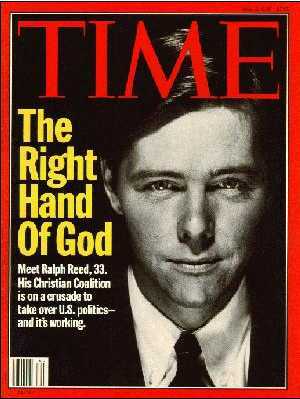 It was under his leadership in the 1990s that the Christian Coalition became a political powerhouse (this Time magazine cover is from May 1995). As chair of the Georgia GOP in 2002, Reed helped elect the first Republican governor since Reconstruction, took out an incumbent Democratic Senator, gained a majority in the state Senate and made gains in the state House. In 2004, running the Southeast arm of the Bush campaign, Reed delivered 500,000 more votes for the president in GA than he got in 2000. The House went GOP in 2004, too. It is in those very places [suburbs/exurbs] where [Reed] saw his political career sidetracked last night. Thanks to an aggressive advertising effort by state Sen. Casey Cagle in the last few weeks of the campaign and similarly aggressive coverage of Reed's candidacy by the Atlanta Journal-Constitution, Metro Atlanta Republicans decided they could not take the risk of supporting a tarnished candidate. Cagle won the four big counties (Fulton, Cobb, Gwinnett and DeKalb) in and around Atlanta by a combined 19K votes. Add in the further afield exurbs (including Cagle's native Hall Co) and over half of Cagle's margin came from just the Metro area. The further away from Atlanta, the better Reed seemed to do. He won or broke even in the three most sizable GA locales outside of Atlanta, Savannah (Chatham Co), Augusta (Richmond Co.) and Macon/Warner-Robins (Bibb and Houston Co's), and won a number of scattered rural counties. Maybe those voters in the Southern 'burbs aren't as solidly in the conservative Christian camp as many suspected. Or perhaps these "values voters" decided Reed didn't represent their values after all.